LOS ANGELES, Calif., June 28, 2013 (SEND2PRESS NEWSWIRE) — Today, Torrance Calif.-based Neotrope(R), an advertising, marketing and PR firm launched in 1983, announced the recipients of its annual Non-Profit PR Grant for 2013. Each worthy cause is a U.S.-based 501(c)3 charity “doing good” on a local, or national level. As part of this in-kind grant program, Neotrope is providing PR solutions, news dissemination (through its Send2Press(R) Newswire service), online advertising, and social media marketing for the charities. This cause-related marketing program is intended to help raise awareness of the 501(c)3 non-profits to traditional media, to the public, as well as to potential “halo” sponsors and donors. In 1986, a group of engineers, college faculty and secondary educators created an innovative out-of-school program designed to inspire and prepare underrepresented and underserved students to pursue science, technology, engineering and math (STEM) careers. Launched in one school with 40 students, CPEP is now in 11 school districts, 42 schools and directly impacting 1,500 students annually across Connecticut. CPEP serves as a catalyst to change underrepresented and underserved students’ knowledge, attitudes and behaviors toward the pursuit of STEM education and careers. Results indicate there is a consistent 60 percent increase in the percentage of students who desire to pursue a STEM career after just one CPEP experience and 90 percent of CPEP students report acceptance into college. CPEP has won several awards recognizing the organization for its achievements and accomplishments, including the Turbo Award for Excellence in Nonprofit Management by the Harvard Business School Alumni Association of Connecticut, the Golden Torch Award from the National Society of Black Engineers, the Presidential Award from the National Science Foundation for its Mentor Program in the New Haven Public Schools, and the 21st Century Solutions Award by NBCUniversal Foundation. With 2013 marking its 25th anniversary, CPEP seeks to leverage its accomplishments to continue to grow and position CPEP to impact the workforce of the 21st century. For more information about CPEP visit http://www.cpep.org/ . Based in Bethesda, Maryland, Center for Student Opportunity (CSO) is a national 501(c)3 nonprofit organization empowering first-generation college students on the path to and through college. CSO creates tools and resources to help first-generation college students and their supporters navigate the college process and partners with colleges and universities across the country to promote and strengthen campus efforts supporting first-generation college students. CSO’s newest initiative, “I’m First,” is building an online community of support for first-generation college students. “I’m First” is collecting pledges and stories from first-generation college graduates – and students who will be – to inspire the next generation of students who will be first. In addition to showcasing first-generation college student stories, “I’m First” helps aspiring first-generation college students research colleges, ask questions and get answers, and find support and scholarships in their pursuit of college. Learn more at: http://www.imfirst.org/ . DesignWise Medical is a Minnesota-based, 501(c)3 non-profit organization founded in 2008 whose mission is to develop medical device and product solutions to children’s unmet medical needs. It is a volunteer-based organization funded entirely by charitable contributions, foundation and corporate grants. Children need devices that are safe, effective and sized appropriately for them. Technology already exists that could address many children’s unmet medical needs, improving outcomes and quality of life and ultimately reducing health care costs. However, these markets are small, making it difficult for traditional medical device companies to achieve an adequate ROI. DesignWise Medical is able to develop pediatric devices for approximately one-fifth (1/5) the cost of the traditional for-profit approach. Through the sustained involvement of pediatric clinicians, parents, sponsors, volunteers and students, DesignWise Medical is able to identify, create and deliver collaborative solutions to this underserved population. To date, more than 280 volunteers have donated over 30,000 hours of their time working on ten active pediatric device projects. DesignWise Medical has sponsored 32 student projects at nine colleges and universities, providing learning opportunities for higher education student volunteers, helping them to succeed in today’s competitive medical technology job market. More information: http://www.designwisemedical.org/ . Food Finders is a community-based food rescue organization, founded in 1989, that serves as a conduit for food, education, and awareness between donors, volunteers, agencies and people in need. Its vision is to eliminate hunger and food waste, while improving nutrition in the communities we serve. Headquartered in Signal Hill, Calif. (in Los Angeles county), Food Finders picks up donated food from hundreds of local grocery stores, bakeries, restaurants and produce markets and distributes it directly to more than 200 missions, shelters and social service agencies to feed the needy and impoverished. Food Finders also helps merchants comply with the California Waste Management law, requiring them to cut their waste by 50 percent, and more recently mandated, 75 percent. Instead of going to landfills, the wholesome, consumable food is being used to feed hungry children and adults. Learn more online at: http://www.foodfinders.org/ or follow on Facebook at: https://www.facebook.com/foodfinders . The National Inclusion Project works every day to make the inclusion of children with disabilities a reality. By driving the movement for social inclusion, children of all abilities learn and play together. Children with disabilities and their peers who are typically developing, come together to participate in recreational activities such as swimming, arts and crafts, community service, physical fitness and more. To date, the Project has partnered with over 200 programs nationally – including YMCAs, Boys & Girls Clubs, Girl Scouts, CampFire USA, etc. – and has impacted over 50,000 children. For more information on the National Inclusion Project and to help ensure no child sits on the sidelines visit their website at http://www.inclusionproject.org/ . To follow on Facebook, visit: https://www.facebook.com/inclusionproject . In addition to the 5 grant winners noted above, Neotrope this year also “re-adopted” several grant winners from prior years, including The Bob Moog Foundation ( www.moogfoundation.org ) in North Carolina, and the Pacific Pinball Museum ( http://pacificpinball.org/ ) in California. With this cause-related marketing grant program, Neotrope has been honored to help many worthy causes in past years, including Camp Blue Skies, Children Awaiting Parents, Fresh Start Surgical Gifts, Girls Write Now, Move for Hunger, The Native Voices Foundation, Special Equestrians, Starlight Children’s Foundation, World Savvy and dozens more. Grant recipients are selected by Neotrope/Send2Press staff based on qualified applications filled out and submitted by U.S. based non-profit orgs. Choices for grant “winners” are both subjective, and based on overall activities and actual need, as well as best fit for support from the marketing team. Additional information regarding the Neotrope 2013 J.L. 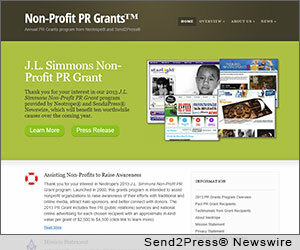 Simmons Non-Profit PR Grant program for U.S. charitable non-profits and grant recipients can be found at: https://www.send2press.com/non-profit/ and also https://prgrants.com/ .